The Mansfield ISD Police Department will determine number of security staff for each event where needed. State law and school district policies will be in effect concerning alcoholic beverages and controlled substances. Confetti, balloons, or similar items requiring detailed clean-up are not permitted in the stadium. Cannons, train horns, air horns, long trumpet horns etc. are not permitted. No sound systems will be allowed into the stadium. Items such as Frisbees, balls, whistles, etc. are not allowed. Glass bottles / containers are prohibited in the stadium and parking lot. No pyrotechnics can be used in the facility. Representatives from Mansfield ISD Booster clubs from each school may sell school specific spirit item by their own grandstand; however, you must have a permit from Mansfield I. S. D.
Tailgate parties must be inline with MISD tailgating regulations. Gates will open 1 hour 30 minutes prior to the game time for spectators. Home gates are located on the west side of the stadium. Visitor gates are located on the east side of the stadium. All high school students must have a school ID or accompanied by a parent/adult to enter the game. All home students with an ID will enter the stadium though the student gate (home - gate 1 / visitor - gate 4). All elementary, intermediate, and middle school students must accompanied by an adult to enter the game. 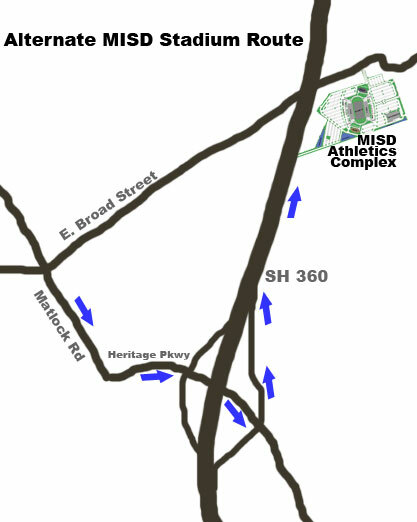 Band members, drill team, cheerleaders, and pep squads must enter through the assigned gate (MISD home – south iron gate / visitor – north iron gate). They must be accompanied by a sponsor. Spectators will not be allowed to leave the stadium and return without purchasing another ticket. No outside food or drink may be brought into the stadium; this does not apply to band, drill team or cheerleaders. No pets allowed except for guide dogs. All equipment on wheels must not be moved across the field. Please move such equipment around the outside boundaries of the field. All team personnel that are not in uniform must have a sideline pass. This includes coaches, trainers, student trainers, student managers, and any other support staff. Cheerleaders that are not in uniform must have a pass. Each school is responsible for their sideline. No long metal spikes or cleats may be used. Food, gum, sunflower seeds and tobacco are prohibited at all times around or on the field area. Props that will mark or cut the field surface will not be permitted. Victory lines should be limited to drill team and cheerleaders only. Spectators are not allowed on field before or after the game. Decoration of the locker rooms is not allowed. No red power drinks may be used in the field house at any time. Only authorized personnel in the field house area before the game, at halftime, or after the game. MISD will not provide towels. MISD is not responsible for any articles left in the dressing rooms before, after, or during games. No artificial noise makers will be permitted in the stadium. No face paint or sign paint allowed in the stadium. No loitering will be permitted. Spectators must sit in the stands and keep off the rails. Aisles should be kept clear at all times. Students may not cross to the other side of the stadium. All signs and banners must be to promote the school team and program. No negative signs toward opponent. No signs or hung from the top rail fence. At the closure of event, designated personnel from each school will remove all signage and straps. Turn south on Matlock Road, next to the Mansfield Methodist Hospital. Turn left on Heritage Parkway heading east. Turn left into northbound State Hwy 360. 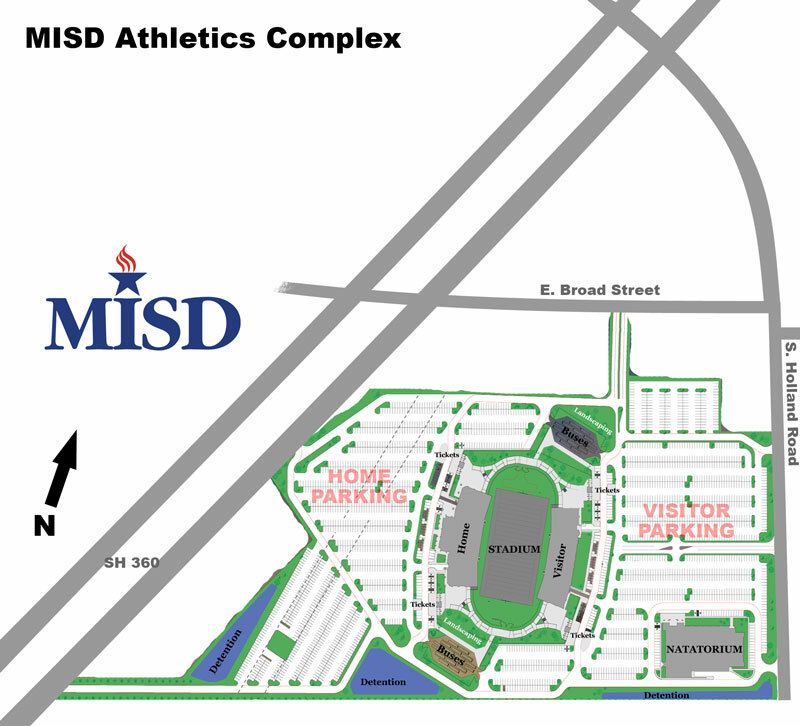 MISD Stadium entrance will be on your right.